With Yom Kippur right around the corner, and Columbus Day as well, all Americans, not just Jews, should face the reality of our nation’s shameful history of the near-decimation of the Native Americans. Christopher Columbus has historically been given credit for the wrong things and it’s time we take a reality check. Based on earlier voyages by other explorers, Columbus already knew that the earth was round before he set sail. Columbus’ objective was to find gold and other precious metals and claim territory for his benefactors. Vikings and others had discovered America before Columbus. Protesters demonstrate in front of Dallas-based Chief Oil & Gas. When Columbus landed in the Bahamas, met by the friendly and docile Taino Indians, his first thoughts were of how easily they could be subdued and enslaved, which is what he quickly accomplished. Columbus, his men and other Europeans who followed, brought with them diseases which they had immunities to, but which eventually decimated the native population. So, if you want to give Columbus his proper due, credit him with introducing slavery into the New World and making use of superior European weaponry to conquer, subdue, and enslave a native population. Given the fact that Native Americans were residents of the Americas long before Columbus and other Europeans arrived on the scene, we should also acknowledge the more than 300-year destructive history of the Indian civilization by Americans and the English colonists before them. Instead of having open discussions leading to mutually agreed-upon treaties, colonists formed militias, armed with their advanced European weaponry, forcing Native Americans away from their traditional hunting, fishing and agricultural lands. Most treaties were forced on tribal leaders and all 400 treaties have been violated in one form or another. Indians were given what was then considered the poorest-quality land in some of the most desolated areas. In later years, discoveries of gold, oil or other resources on those same lands resulted in extensive treaty violations, and in some cases, forcible removals of Native Americans. Problems continue. 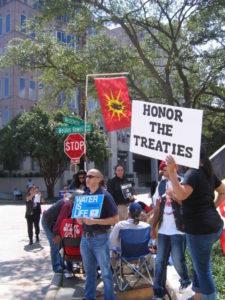 Recently, the American Indian Movement of Central Texas demonstrated at an oil pipeline company’s corporate headquarters in Dallas. They protested the building of a pipeline in the Dakotas, close to the Missouri River, endangering their water supply if a break in the line were to ever occur. A federal judge recently ruled that construction on the northern pipeline must be halted, a rare but satisfying victory for Native Americans. What can you and I do to help? First, stop glorifying Columbus and recognize the true place in history of our earliest Americans. Many Texans are unaware of the fact that Texas has joined 16 other states in refusing to recognize Columbus Day as a national holiday, which is a step in the right direction. While some states have substituted Indigenous Americans Day for Columbus Day, another possibility is suggested by what the Australians did to apologize for wrongs done to their Aboriginal people, calling a day of forgiveness each year, National Sorry Day.